Urvashi Vaid is the director of the Engaging Tradition Project at the Center for Gender and Sexuality Law at Columbia Law School and the author, most recently, of Irresistible Revolution: Confronting Race, Class and the Assumptions of LGBT Politics. 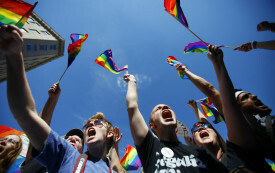 What’s Next for the LGBT Movement? With victory in the fight for marriage equality in sight, what should LGBT activists focus on now?